EDB to Office 365 Converter allows the user to convert emails from Exchange Server to Office 365 account. Convert emails, contacts, notes, journal, tasks items of EDB mailboxes file to Exchange Online mailboxes without any data loss. EDB to Exchange Online software converts recovered data from Private & Public EDB files of Exchange Server which are Offline or Dismounted in nature. 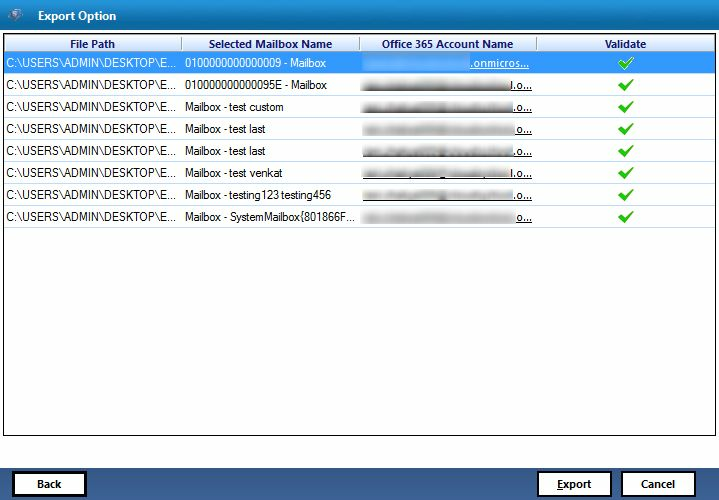 Tool exports different mailboxes folders of Exchange database file to Office 365 mailboxes. While conversion of Exchange Server files to Office 365, a user can validate the credentials details of Office 365 Account within the software. In Advance, settings feature user can validate O365 account credentials such as Admin SMTP & Password to export mailbox items successfully. This Filter helps user to export selected emails messages between particular dates and move only the selected emails file between these data to MS Office 365 Account. 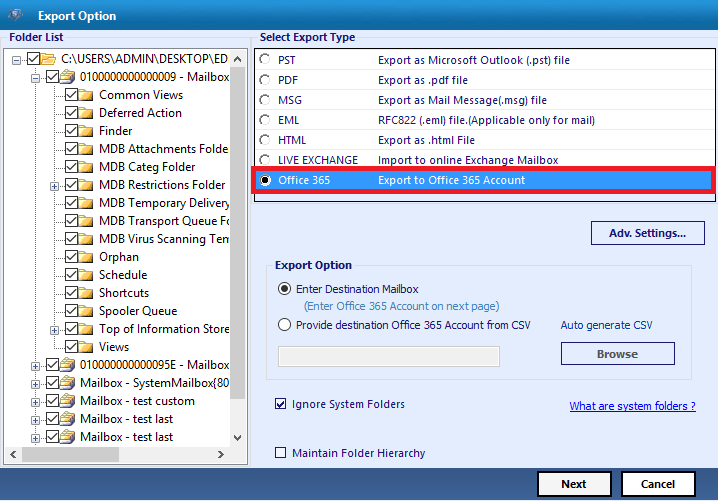 A user can export selective items while conversion of Exchange EDB File to Office 365 account. The software offers an advanced setting feature to export selected Exchange file items such as Mails, Contacts, Calendars, and Tasks while conversion process..
As Exchange server used to centralized information of emails so that they can backup properly. It helps administrator to maintain information properly but some time due to problems such as Exchange Server crashed frequently, Dirty shut-down, Logical database error, hardware error lead to corruption problem damaged Exchange EDB File and user can't access their mailbox information. To resolve these kinds of problems, a user can convert Exchange Server data to Office 365 account. As Office 365 Account offers different features such as recovery & backup option. Access email information without installation of heavy software. Provides 24/7 support services for MS Outlook user to fix any problem while working within Office365 account. Email encryption features and protection from the virus or spamming messages. An EDB to Office 365 Converter Tool convert data from corrupted and damaged Exchange EDB files to Office 365. The tool offers different features that simplify the process of conversion, even a naive user can easily restore Exchange File data. 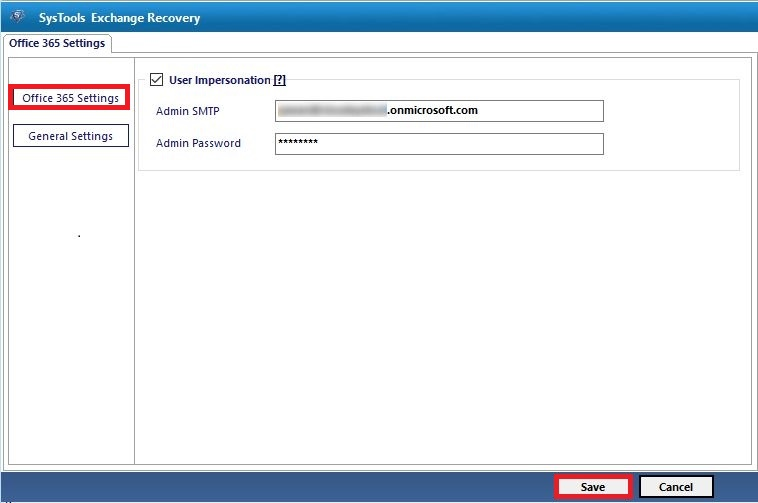 A user can export the recovered data items into MS Office 365 Account. User can convert the selected items into their Office Account as per their requirement. 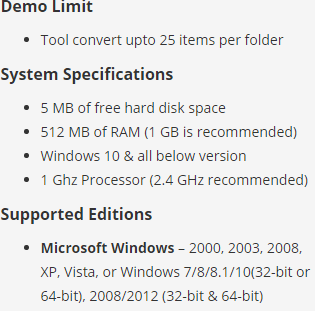 User need to just check the items in Advance Settings migrate the desiresd emails, contacts etc. 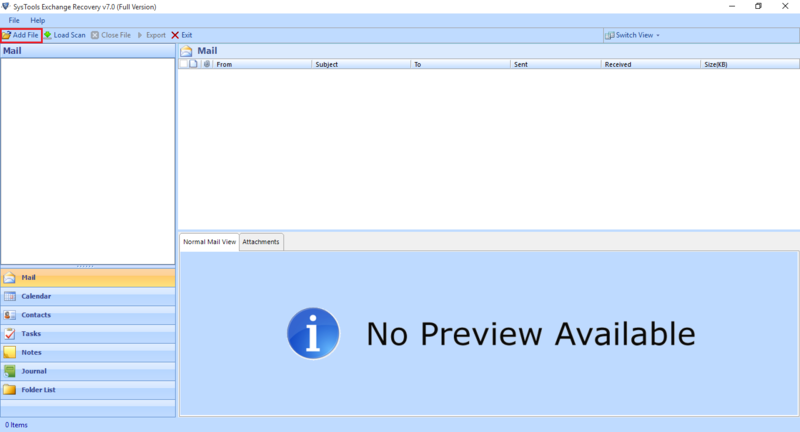 Launch Exchange to Office 365 Software and Click on "Add File" option to load EDB File. 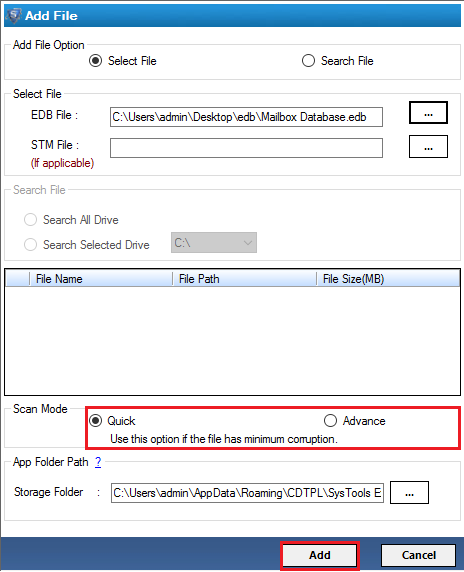 Select EDB File & Click on Browse option to select File. After selecting file, user can select "Quick Mode" and "Advance Mode" to scan File. Select Mode and click on ADD button. Now user can view details of EDB File. To Export File, select the check-box of message file. Click Right & select "Export" option. Select the "User Impersonation" option & provide Admin credentials to move Exchange file data to all mailboxes. Click on "Save" button. EDB to Office 365 Tool: All Doubts & Queries! To use Exchange to O365 Software, is live Exchange Server environment is necessary or not? No. Use can migrate data of EDB file to office 365 account without live Exchange Environment. Can Software search EDB file stored on local drives? Yes. 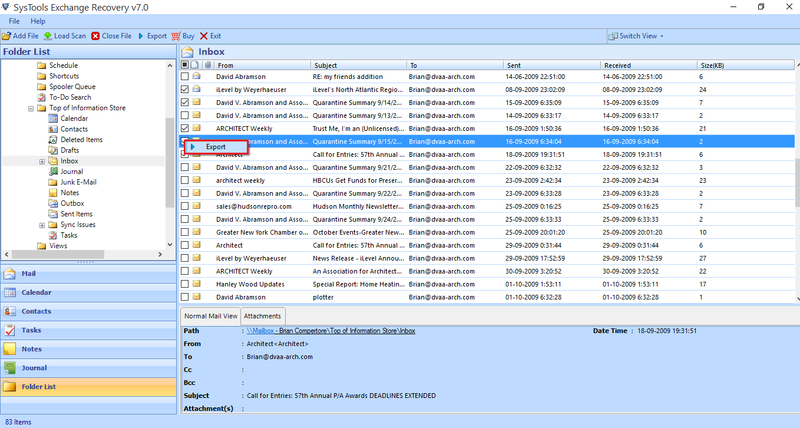 Advance search option can search the EDB files stores in specific drives or all drives. Can EDB to Office 365 Converter recovered data from corrupt file of Exchange Server? Yes.User can recover data using Quick and Advance mode to recoverd data from EDB & STM Files and easily convert EDB mailbox folder into Office365 account. Totally Satisfied with the performance of Exchange to Office 365 Converter. Tool converts my important emails message with an attachments but also offers me option to export selected convert Exchange EDB emails to Office 365 account. Try different manual method to convert Exchange file to O365 account but failed then my friend recommends EDB To Office 365 Converter software. Exchage to Office 365 converter really works in effective manner, get all mailbox folder and files in Office 365 Account. Finally get the tool that convert Exchange Server database file items to Office 365 Account without changing the folder structure and wihtout any data loss. Solve my problem as well as many people, who are eagerly waiting for these kinds of EDB To Office 365 Converter tool.
. One of the best Migrator tool to move EDB file data directly to Office 365 Account. Recommend to all Exchange user, who want to migrate Exchange file to their Office account without losing even a single bit of data. Copyright © 2008-2019 OutlookEmails ™ All Rights Reserved.